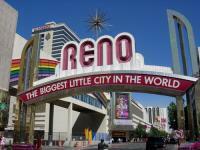 My home is in Reno, Nevada, and it feels like a small town. Between the Sierra Nevada and the Carson Range (the Great Basin, as it’s known), is high desert with four distinct seasons and crisp and clean air almost all year. Fall’s arrival has brought the first splash of autumn color to the leaves of the mountains and city. California’s Pacific Coast weather comes to us, rising from the sea and crossing the steep peaks of the mountains, usually taking two days for San Francisco rain to reach us. Even though the Sierras are a barrier between Reno and much of the world, I see reflections of the greater world and connections to what is happening everywhere, reflections and connections of different kinds of violence that are contributing to my autumnal sense of melancholy. This September in Reno has been colored with tragedy. First there was a shooting in Carson City on September 6. A gunman entered an IHOP in Carson—30 miles south of Reno—with an AK-47, targeted National Guardsmen, shot eight people, then killed himself. Three of the eight people who were wounded have since died. Some people who knew the shooter remarked that he was a gentle person and a nice man, but schizophrenia distorted his mind and actions with disastrous results. The Reno Air Show scheduled for September 16 through September 18 ended tragically after a plane crashed into the viewing stands. The death toll kept rising—from three deaths the first day to 11 at last report. Many people from all over the U.S. love Reno’s Air Show and come to see the vintage planes in action. For all the Renoites and air show fans, this has been a sad time. Last weekend topped off the list of tragedies with two rival motorcycle gangs—the Hells Angels and Los Vagos—shooting at each other in the Nugget Casino in Sparks. The leader of the Hells Angels’ San Jose club was killed in the gun fight. Motorcycle riders from everywhere come to Reno to have a good time during the Street Vibrations annual celebration of motorcycles, food, gambling, and rock and roll, but the two gangs’ hatred got the best of them—or the worst of them, you might say. These September tragedies have been expressions of different kinds of violence—violence caused by insanity, by accident, and by hating somebody just… because. Sadly, these incidents of violence are happening everywhere, not just in Nevada. They are repetitive patterns. There are other, more pernicious, patterns of violence that make the news with numbers and statistics, but without the names and faces of victims or perpetrators. Endemic unemployment is an ongoing form of economic violence that hurts Reno and the whole state. Nevada has had high levels of unemployment since the crash of 2008. After reaching and sustaining levels of almost 15 percent unemployment through December 2010, that number finally dropped to 13.4 percent in August 2011. It’s still too high. Economic violence is systemic violence against working people, perpetrated through the actions of individuals, groups, and organizations that want to make a profit above all else. The diminishing financial picture for millions of Nevadans and people worldwide hurts our neighborhoods and cities; our communities and societies. Although this economic recession or depression may seem like the Air Show plane’s accidental crash into the stands, there have been real people behind it—people whose actions were motivated by the quest for greed and power. A recent study of stockbroker behavior by a Swiss university is only moderately shocking. “…Stockbrokers [behave] as though their neighbor had the same car, ‘and they took after it with a baseball bat so they could look better themselves,'” one of the researchers told German news magazine Der Spiegel. Sounds like the gang killings in the casino to me—or is it the IHOP shooter? Traders and bankers are in it for the money and power. Period. To top off the dismal unemployment data, another part of the picture is that employers are discriminating against the unemployed in a pattern that is torqued even further against people of color, especially African Americans. What kind of deliberate violence is this? That it is tolerated and condoned is pathological, for sure. Because the Civil Rights Act of 1964 doesn’t include the unemployed that gives employers the right to discriminate? That’s where I begin to be shocked. I want a system of government and governance that can foster and support the wellbeing of our people, nation, and world. The challenges we face are daunting and good governance could help. But, given the profile of psychopathology in politicians, is it any wonder that the U.S. Congress is playing a game of brinkmanship? We are caught in a zero-sum game that negates the people, communities, small towns, cities, and states of much needed support to turn the economy away from all kinds of violence. While we’re caught in the zero-sum game of our dismal, internal politics in the U.S., the world continues to move and evolve. Outside the borders of our nation, some of our world neighbors’ actions are designed to hurt us just like the rival gang members hurt each other. If our economic system is driven by individuals with a psychopathic personality and our government is guided by politicians who “have the characteristics of psychopaths without the criminal intent,” I can see that my melancholic September is caused by more than just the turning of the season and the tragedies of Western Nevada. What is going on in my community and in our communities is a reflection or fractal of what is going on in the larger systems we are part of and the greater world we share. As I’ve lived through this September, I have tried to remember that we are all connected; that what happens in one small corner of the world is part of the whole. Still, I would like to see us here in Reno, Nevada; in the U.S.; and in the world move away from psychopathology and toward wellness.